To have one's thumbs securely tied together by any person in an audience and examined by the spectators, then have some one throw a hoop or bicycle rim on one of the performer's arms as if the thumbs were not tied, seems impossible, yet this trick can be done, and its simplicity is its own protection, even though performed close to a committee selected from the audience. A stick can be held perpendicularly by anyone with one hand at each end and the performer can thrust his arms at the stick which passes between them with the thumbs apparently tied tightly together. The same effect is produced on the arm of any person, while the hands are tightly clasped, and before and after each movement the tied thumbs are examined by the committee. The two cords used for the trick are made as follows: The first should be about 17 in. long, 1/4 in. in diameter at its center and tapering to points at the ends. The other cord is about 13 in. long, 1/8in. in diameter in the center and also tapering at the ends. They are constructed of Chinese or Japanese paper, which is a soft, but very tough, fibrous texture. Cut the paper into strips, 1 in. wide, taking care that the grain, or rather the fiber, runs lengthwise. Beginning at one end, twist the paper on itself at an angle as in rolling the old-fashioned paper lamp lighter. Each turn should lap over the former about half of its width. When within 3 in. of the end of the first strip apply another by moistening the joining ends and continue the twisting. When the length given is reached, break off the strip and start back over the first in the opposite direction. Lay on enough layers to secure the diameter given. When finished, the cords should be strong enough to resist the pressure applied by the hands. 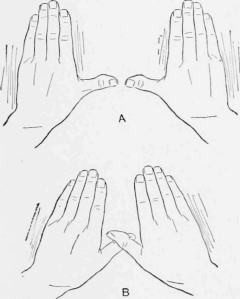 With all fingers pressed together spread both thumbs away from the hands, as shown at A. Lay the right thumb across the left, as at B, the large knuckle bone of one lying directly over that of the other. The largest cord is laid over the crossing and both ends brought down, crossed under the thumbs, then up again, and tied in two knots on top of the right thumb, as at C. The trick in the tying is at this point. Just as the tie is being made pull the left thumb until the smallest-diameter joints reach the cord and pull down with the left hand. Push the right thumb so that the fleshy part enters as far as possible into the cords. Insist on the tie being made tightly. 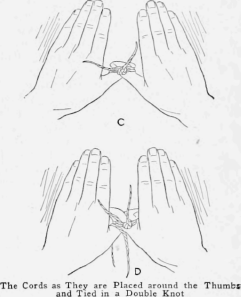 The second and smaller cord is laid below the right thumb as shown at D, and on top of the left against the first cord, crossed, brought back and tied twice. 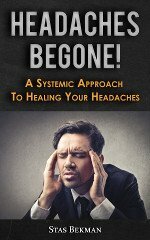 When this is being done reverse the pushing and pulling as described, pushing the left thumb and pulling out on the right. Secure all the slack on the left thumb, the right being pushed into the cords at its smallest diameter and the second cord being tied high up and as near the right thumb as possible, with knots tightly drawn. If this second knot is not tight it will give trouble in performing the trick. The release is made by bringing the tips of the fingers together and placing the thumbs into the palms. If the ties have been carefully made there will be no trouble to withdraw the left thumb as it is masked by the hands. The peculiar nature of the paper cord causes the loop from which the thumb was removed to remain open and rigid as a wire loop, and if the last tie was tightly drawn, the second cord will not slip down to close the loop. In approaching the hoop, stick, or arm, touch the thing to be passed with the finger tips and withdraw them, swaying backward a few times and, in the last swing before making the pass, remove the thumb from the loop. After passing, replace the thumb in the loop. In passing the object, open the finger tips, then close them and open the palms, and push the left thumb back into the loop, close the palms and apply a strain on both thumbs, then show the tie. Be careful to press both thumbs closely into the palms in passing so that they will not strike the object. Always exhibit the tie from the back of the hands with the palms spread out. If there is any difficulty in drawing out or replacing the thumb in the loop, it is because the ties have not been properly made or tied when the thumbs were in the right place. It requires some practice to do the trick quickly. - Fayette.